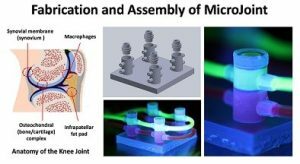 The National Institutes of Health (NIH) has awarded a $1.2 million grant to a multi-institutional project led by the University of Pittsburgh to engineer a 3-dimensional joint-on-a-chip called the “microJoint,” to replicate a human joint on a small scale. The microJoint will be used to study and test drugs for the treatment of arthritic joint diseases. McGowan Institute for Regenerative Medicine associate director Rocky Tuan, PhD, is the principal investigator of the award. Trauma, inflammation, infection, and aging can cause damages to joint tissues, ultimately leading to arthritic disorders, including osteoarthritis, that cause physical disability and compromise quality of life. Despite being the most common degenerative joint disease, affecting almost 1 in 6 people, osteoarthritis has no effective treatments, largely because the disease is poorly understood, and animal models that are commonly used in research do not sufficiently replicate human disease due to anatomical and functional differences. The microJoint project led by Pitt, with collaborators at Stanford University and Tulane University, is part of a national initiative by the National Center for Advancing Translational Sciences (NCATS) of the NIH to develop 3-D microphysiological system platforms that model human disease. The Tissue Chip for Disease Modeling and Efficacy Testing program intends to enable researchers to better recognize and identify disease and more accurately predict how patients will respond to treatment drugs. The Pitt project is the only one in the program that is focusing on degenerative joint diseases. Pitt is one of 13 institutions receiving NIH awards to support research aimed at improving the success rate of drugs that are tested in clinical trials. Currently, more than 60 percent of investigational drugs fail in clinical trials due to a lack of effectiveness, despite showing promise in cell and animal research models. “We’re building what will be the first joint-on-a-chip that we hope will accurately replicate arthritic diseases in humans, and thus allow in-depth understanding of the disease process that will lead to discovery of potential therapies,” said Dr. Tuan, director of the Center for Cellular and Molecular Engineering, and Distinguished Professor in the Department of Orthopaedic Surgery at the University of Pittsburgh School of Medicine. Dr. Tuan is internationally known for his research in stem cell biology, musculoskeletal tissue engineering, regenerative medicine, and for his innovative leadership role in biomedical education. He also is director of Pitt’s Center for Military Medicine Research. In addition to Dr. Tuan, the co-investigators on the award are Bruce Bunnell, PhD, director of the Tulane Center for Stem Cell Research and Regenerative Medicine and professor of pharmacology at Tulane University School of Medicine, and Stuart Goodman, MD, professor of orthopedic surgery at Stanford University. The researchers will engineer the chip by creating and combining multiple joint tissues, including cartilage, bone, the joint capsule, and fat. The tissues will be generated using a specific type of adult stem cells called mesenchymal stem cells, encapsulated within a light-activated gel that will act as a scaffold. In addition, the model will include macrophages, which are immune cells that are linked to inflammation commonly seen in joint disorders. The biological interaction among these joint tissues and cells will be modeled by culturing them in individual custom-fabricated micro-bioreactors that are connected to each other. The first microJoint models will seek to replicate normal joints and those affected by injury, inflammation, and diabetic complications. Once that is accomplished, the researchers plan to test different drug compounds for their ability to heal diseased joints. The awards are supported by the NCATS Tissue Chip for Drug Screening program, which leads this effort in collaboration with other NIH Institutes and Centers. Illustration: Tissue components of the knee joint (left) modeled by the human microJoint, consisting of tissues housed in individual microbioreactors that are connected (right). Credit: Rocky Tuan/University of Pittsburgh.